The pouch is about 7 inches wide, about five inches tall, and about 2.5 inches deep. It uses 4 channels and 4 rows of MOLLE space. 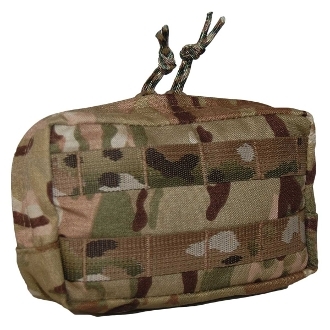 The face has two rows of pattern-matched PALS webbing for attaching smaller pockets to it. It's available in black, coyote brown, Ranger green, and Multicam. The pouch is made in the USA and carries the same lifetime warranty that all ATS gear is covered by.